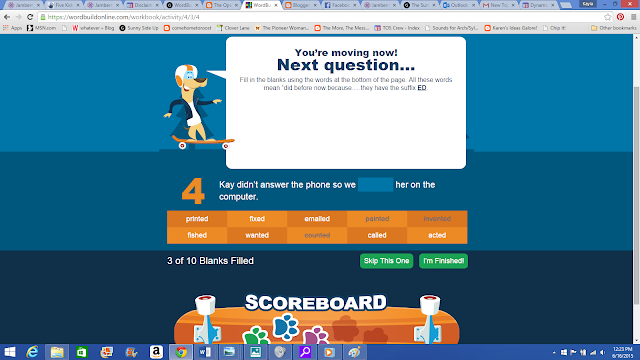 Here is a fun one we got to try from Dynamic Literacy called WordBuildOnLine. 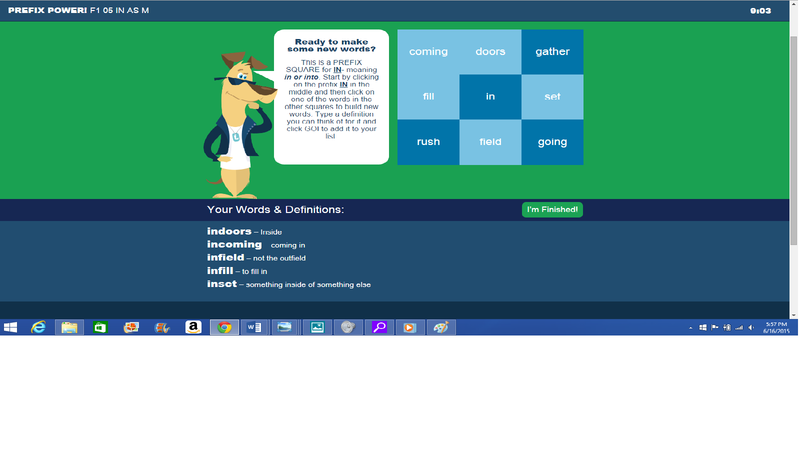 WordBuildOnLine is a vocabulary program that spends time working on individual parts of the words and what they mean. (Like root words, suffixes and prefixes). The program we used was designed for 2nd through 5th grade, so S-girl and A-man were my lucky students for this one. 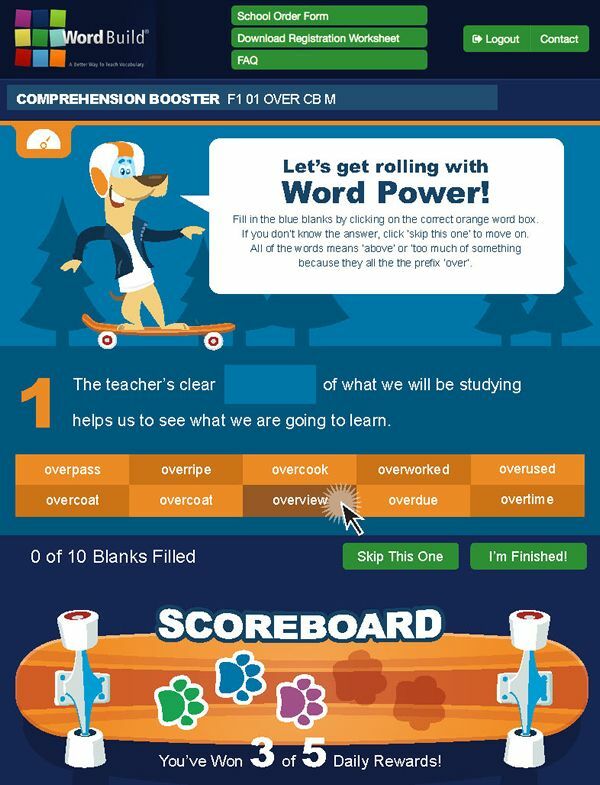 WordBuildOnLine has you doing the same group of five activities for each unit. So, each day, you log on and hit the start button. First you will see a short little video After the video, you will do your activities. It is designed to take less than 15 minutes total to finish. There is even a timer in the upper right hand corner of the screen that counts down your time spent. In addition, the activities keep track of how long you are taking to complete them individually too. Now, they even specifically say in ALL CAPS that the timer isn't supposed to be used as A RACE TO SEE HOW FAST YOU CAN DO THIS. But, they have obviously NOT met me OR my children. It is one of those personal points of pride to try to beat your score and do things just a little bit faster than you did last time. This program is also designed to just truly work for 15 minutes a day, so you don't spend too much time on them. But, again, the Dynamic Literacy folks haven't met my children. When my kids were having fun....or, yes, beating the clock (even though it was very carefully explained to them that it wasn't a race), they would just keep clicking on Continue and Let's Go....and, just...keep on going until they were bored or sick of it. I honestly think that they did a whole week of lessons in one day once. Because they did it this way, I wasn't a stickler about them spending time EVERY day working on WordBuildOnline. But, that is the intended way for it to be used....a little at a time....a little every day. My kids are just weird. I was able to just remind them to get their WordBuild stuff in before they had their regular computer free time. I never got any complaining from them. I took that as a good sign that the program was well done and not something that the kids would dread having to get over with, like a chore....or bath time. Ha!!! Things were also explained well enough that it was okay if I wasn't around when it was time to do their WordBuild stuff. 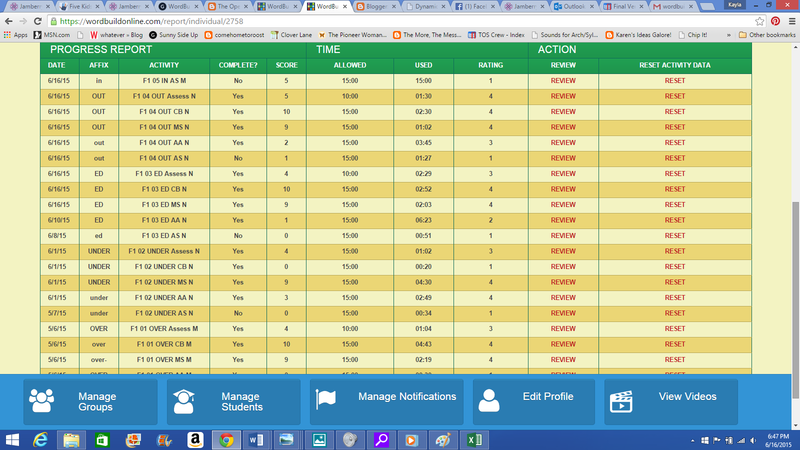 Plus, the system sent me an e-mail telling me when they finished an activity and told me what they had finished. However, it would be worded like this: "S-girl has finished F1 03 ED MS N". So, yeah, in order for me to really know what they had studied I had to ask them or go dig around my parent page for their lessons. There was one activity where it seemed like I got a lot more questions about than others. Below is a screenshot of the one that was, for them, a little on the tough side. Words and definitions part of, in this case, the prefix "in". They were totally fine creating the words, but had a little more trouble putting into words definitions for their new word. Definitely good practice, but a little tricky. I got a lot of questions like, "Mom! What is a definition of outfield?" or, "Mom! What do I put for infill?" Overall, we all liked WordBuildOnLine. The kids liked it because it was fun and moved fast. They also liked it because it wasn't too brightly colored or, in their words.... "baby-ish".. 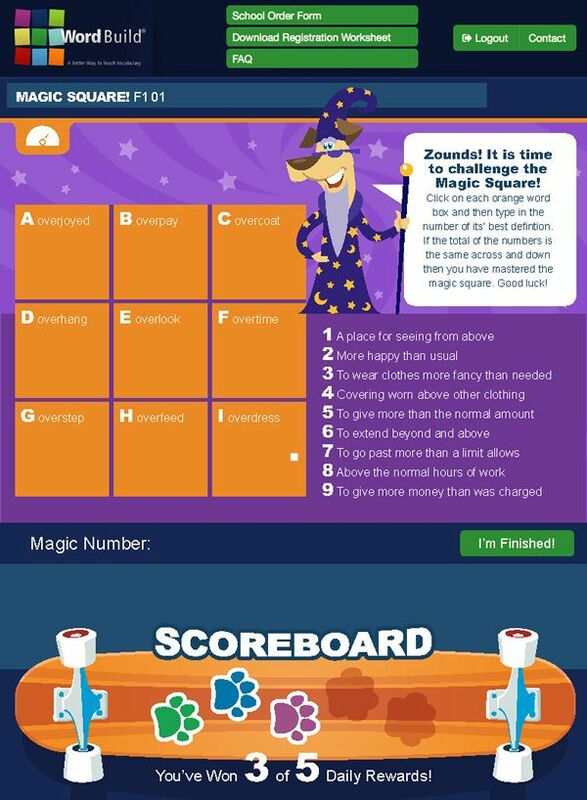 This Magic Square game was listed by both A-man and S-girl as one of their favorite "games" in WordBuild. I liked WordBuild because it was teaching really solid vocabulary and word building principles. It actually reminds me of the approach we take with our older kids with Greek and Latin morphemes. I like that we are starting that approach and way of thinking with the younger kids. I also like some of their encouraging little cheerleading phrases when the kids would get something right. "Nurse, bring me an ice pack! This one is on fire!" The only two bummer kinds of things I can think of is the e-mails that took a special decoder ring to figure out what they had studied that day, and that it took a little bit for them to figure out how to actually click and answer the questions. It isn't a typical double click or even a click and drag thing. You click on the answer and then click in the space for the answer. It was only frustrating to them for the first few lessons, but, then we ALL figured out what needed to happen. But, that is pretty much the extent of the stuff we didn't like with this program. This was a fun one. A helpful one. A quick one. 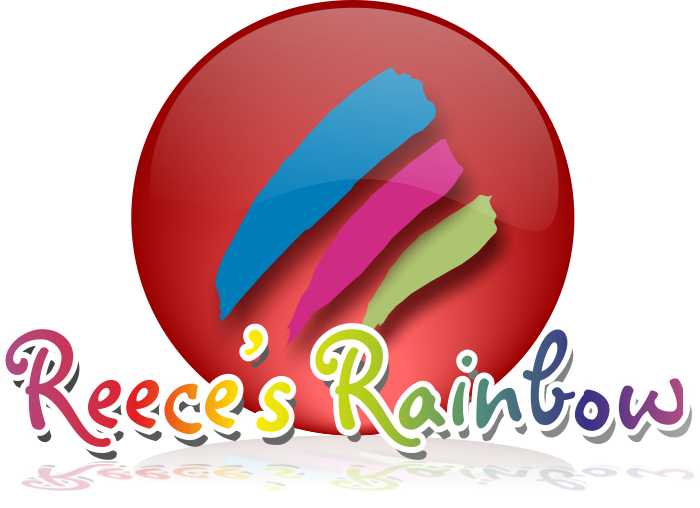 A really good strong early elementary vocabulary program. 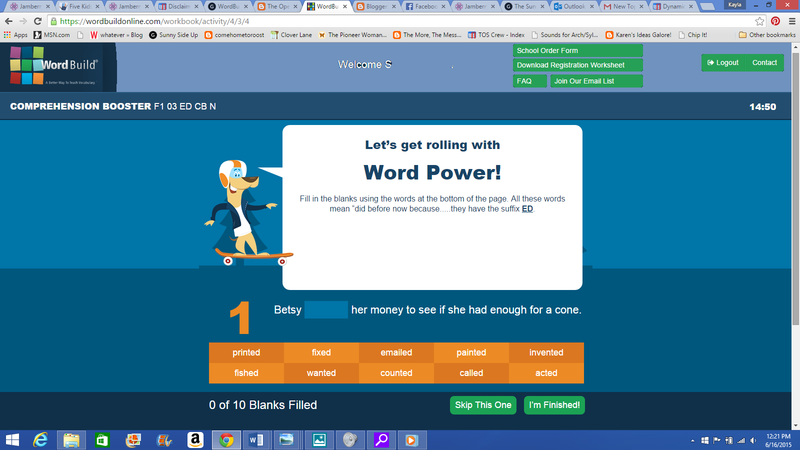 If I have intrigued you to check out Dynamic Literacy and WordBuildOnline for yourself, I have a special reader treat for you! 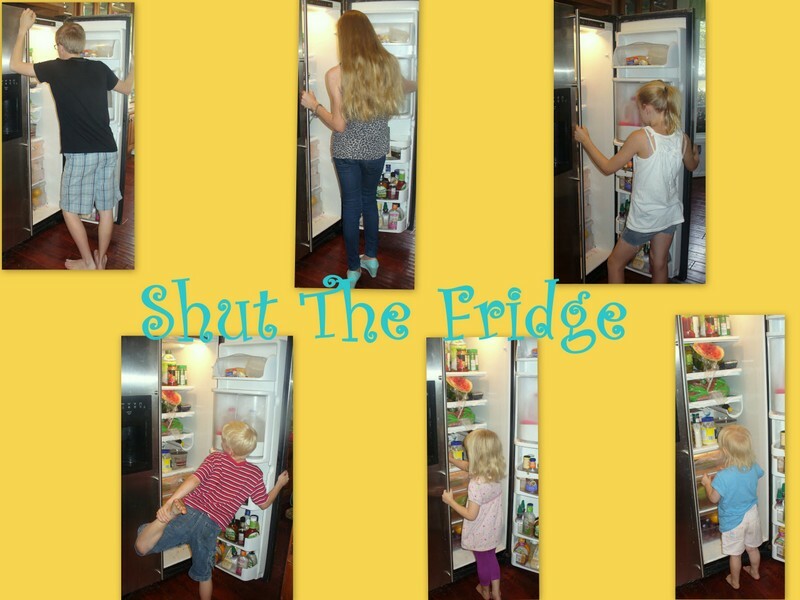 Just enter the coupon Code fridge at checkout and you will get 25% off any of the books at http://www.dynamichomeschool.com/ or 10% off of http://www.wordbuildonline.com/.